Pontefract defeated Hull DCA 5-3. Pontefract bagged their third straight win in Yorkshire Chess League Division Two by beating Hull DCA 5-3. Phillip Beadham got Pontefract off to a good start by winning a knight for a pawn after which his opponent folded. 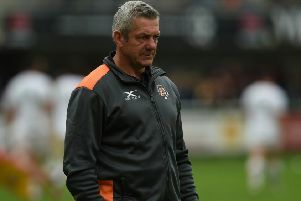 Steve Spencer achieved a draw against a strong Hull player. Hull levelled when Chris Roche’s king was under pressure and he was unable to prevent mate. Norman Carr’s unstoppable pawns forced his opponent to resign and Peter Cooper won his game with a surprise mate attack. Dave Hatfield tried a bishop sack to gain mate which didn’t come off but he still achieved a draw. New recruit Sean McDonald, playing top board for Pontefract, came unstuck against an accomplished player but Steve Parker rounded off the victory with a knight fork on two rooks and queen.